Tina Gaston has done more good for Waco than most people do in their lifetime. At 50 years old, she has spent her entire working career assisting others and is long overdue for a little assistance herself. Ms. Gaston spent her first 10 years of public service as the Heart of Texas Workforce Solution’s Program Manager for TANF (Temporary Assistance for Needy Families), SNAP (Supplemental Nutrition Assistance Program), and RIO (Re-Integration of Offenders). Although she started as a temporary administrative assistant, Tina worked her way up in the organization, taking on one of the largest caseloads. During this time, Tina impacted the lives of thousands of Central Texans, serving as a mentor and friend in their time of need. After the Heart of Texas Workforce, Ms. Gaston applied her talents at the Economic Opportunity Advancement Center (EOAC). She served as the Community Programming Director, continuing to change the lives of her community. Unfortunately, after many years of hard work and assistance, Tina was diagnosed with a benign brain tumor that affects her memory. Since her diagnosis, Tina has undergone three removal surgeries with the most recent being just a few months ago. Tina is now undergoing radiation to prevent the tumor from returning a third time. Now, while undergoing treatment, Tina has several “jobs” she enjoys at home, but they look a little different than her non-profit service. Not only is she a mother to three, she is also a grandmother to nine who keep her busy and active! She is involved in her church and enjoys spending time with her pups! 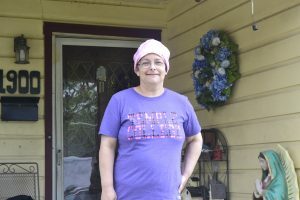 Due to her medical condition, Tina is currently unable to work, leaving her without the opportunity to make the necessary updates on her home. 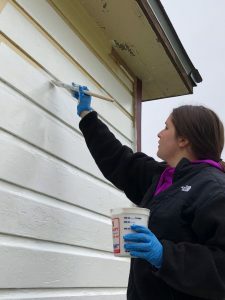 When Woodway First United Methodist Church reached out to us for a service project, we knew Tina would be a great choice! “Tina has shown compassion and service to those around her for years. 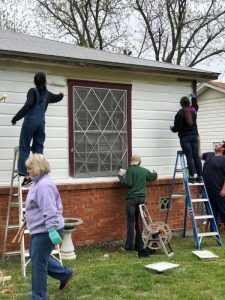 It’s time she felt that same compassion as well,” says Karen Saucedo of NeighborWorks Waco. 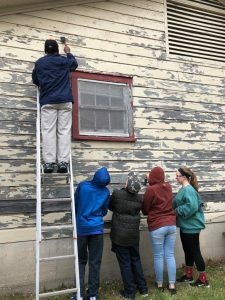 On Sunday, April 8th, Woodway First United Methodist Church volunteered for a day of service to re-paint Ms. Gaston’s house and provide yard work that she is no longer able to perform herself. 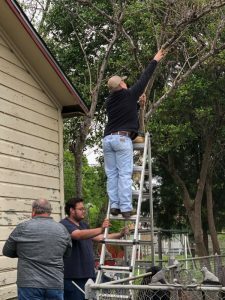 NeighborWorks Waco is proud to serve the community and wants to offer a special thanks to Woodway First United Methodist Church. Both organizations are grateful for Tina’s contributions to our community and wish her all the best in the future! Click here to return to NeighborNews Spring 2018! She is a dedicated person always helping others and is compassionate about finding resources for families. She enjoys helping others to become independent and focus on goals they never knew they were capable of. She brings the beauty out in everyone she meets.. A positive person who never judges and only wants the best for others. Thank you for helping her she definitely appreciates what y’all have done for her.